A pair of primetime addresses from the White House and Capitol Hill demonstrated Republicans and Democrats have made little progress in negotiating a conclusion to the partial government shutdown, which will enter its 19th day on Wednesday. President Trump used an Oval Office address to continue to press for a wall along the U.S.-Mexico border, while House Speaker Nancy Pelosi, D-Calif., and Senate Minority Leader Chuck Schumer, D-N.Y., responded in an address of their own to continue to call it wasteful and unnecessary. Both highlighted federal workers in their address: Trump to praise the work of Homeland Security Department employees whose demands he said formed the basis of his proposals, and Democratic congressional leaders to bemoan the casualties of shutdown politics. Trump labeled the situation at the southern border a “humanitarian and national security crisis” in calling for more Border Patrol agents, immigration judges and a wall. He said his proposals were “developed by law enforcement professionals and border agents at the Department of Homeland Security,” including his demand for $5.7 billion for wall construction. The speech was filled with familiar talking points, figures and anecdotes in an attempt to sound the alarm about what the president views as a dire situation along the border, and was perhaps most notable for what it did not include. 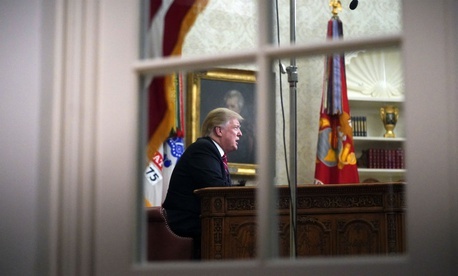 Trump has repeatedly floated the possibility that he will declare a national emergency to give his administration greater latitude in setting aside funding for the wall, but he ultimately opted not to announce that strategy in the first Oval Office address of his presidency. Schumer and Pelosi, for their part, accused Trump of having a “temper tantrum” that was impairing federal agencies’ capacity to deliver crucial government services. Trump is responsible for withholding the paychecks of “800,000 innocent workers throughout the nation, many of whom are veterans,” Pelosi said. Schumer also highlighted employees who will miss paychecks on Friday, while noting some Americans may not be able to secure federally backed mortgages, and loans to farmers and small business owners are being disrupted. “No president should pound the table and demand he gets his way or he shuts the government down,” Schumer said. Trump did not address furloughed employees or feds working without pay directly, but did say his administration “is doing everything in our power to help those impacted by the situation.” The president has previously said federal employees would be minimally affected by not receiving pay and supported the shutdown because they wanted a wall. Schumer and Pelosi reiterated their call to reopen all federal agencies with full-year appropriations, while providing DHS with short-term funding to allow border security negotiations to continue. Congressional leaders will again head to the White House on Wednesday to continue their discussions.